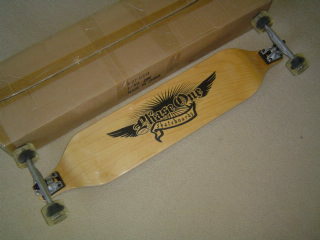 I received my Phase One (P1) 40″ dropdown longboard today. 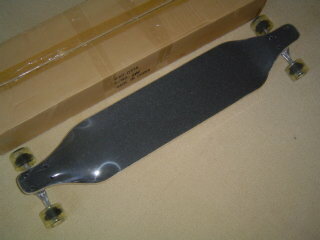 I bought it off eBay from eskatestuff for $150 plus $20 freight to Brisbane. (I note these skateboards have just gone up to $160). eskatestuff certainly has fast delivery. Both items I have bought from them arrived next business day from Sydney to Brisbane. The skateboard is shaped identically at both ends, so presumably it can be ridden in either direction. I will be interested to see the speed of the dropdown longboard. The eskatestuff eBay promo material states, “… these wheels are truly fast”. We will see, given my experience with my Phase 1 42″ longboard. If the skateboard proves to be slow, I will continue with my original plan to replace the wheels and bearings with ABEC 11 Flywheels and Bones Reds skateboard bearings. My dog is ‘giving’ me the board for Christmas, so I have not had a chance to ride it yet apart from whizzing up and down the hallway a couple of times. I am sure I will post an update after 25 December. I have not ridden the board yet, apart from up and down my hallway. When I stand my 85 kg on the board, it flexes a little. I do not see this being a problem and am not expecting the edge of the board to touch down when carving. I could be wrong and will post an update on it after Christmas when my dog has ‘given’ me the board. There is not much point in me measuring the time that the wheels spin, when you do not know how hard I have spun them! What I can say is that they appear to spin freely. Make sure that you check the skateboard category of this blog for some commentary about another Phase 1 board that I bought and my views on its wheels/bearings. I still think that these boards are good value, even if I have to replace the wheels/bearings to get the speed that I want. i dont think that the boards come straight from the manufacturer as a complete board. They must put aftermarket trucks,bearings,wheels and harware on at Australias greastest skate board shop, but you never know, the quality of these parts must be different model to model. The Phase 1 boards come from eskatestuff, not Australia’s Favourite Skateboard Shop. Both sellers are on eBay though. The trucks and bushes are identical on both my Phase 1 42″ longboard and my Phase 1 dropdown longboard. The wheels and bearings are different though. I can not comment on where the boards are assembled. However, they do come in boxes which have the board type stamped on the outside. I can only assume then that they come pre-assembled. Yes. The board is plastic wrapped under the trucks, with the truck bolts screwed through the plastic on the top. It only takes 15 minutes to unbolt the trucks, remove the plastic and bolt them back on, but it is 15 minutes I would rather spend doing other things … like riding the board! I’m 12 years old and do not know which board out of the Bling and the phase 1 dropdown to ask for for christmas. Please advise me which one would be most suitable for carving and bombing hills for my 40k weight, and 140cm height. I have recently seen the Bling board and was wondering whether it would carve well with the softer bushes. That is a hard question, given that I am more than twice your weight and three times your age! The Bling Old School does seem to have hard bushes, but a new set is a relatively cheap fix compared to new wheels/bearings for the Phase 1 longboard. Given your light weight/small size, I think that you will probably be disappointed with the Phase 1 boards until you upgrade the wheels/bearings. You will find them just too hard to push. If I were you, I would actually be looking for a longboard in the 34″ t0 38″(ish) range. Neither of these board match that description. 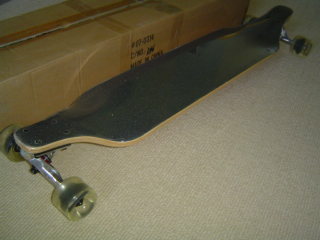 I have to say, I love my Phase 1 42″ longboard with the Bones Reds Bearings and ABEC 11 Flywheels. But the total price is getting up around $245 including freight. Have you considered the Layback range of longboards? They seem to get good reviews and are around the $200 mark. I steered away from them because I did not like the graphics. Both SkaterHQ in Sydney and Skatebiz in Brisbane carry several of the Layback boards, but do not appear to list the range on their web sites. Yes, but my theory is that the speed problem is with the wheels, not the bearings. My theory is that the wheels re-bound too slowly and absorb too much energy — the wheels run very warm compared to my ABEC 11s. You might want to have a look at my Speed is relative post. there is a website called http://www.thelongboardstore.com and they sell tons of wheels for longboards at cheaper prices even than they are in US dollars so i may get some Abec 11 strikers for $45.00 US. That is about $55.00 AUS. A pretty good deal hey. hey just wondering if you know of anywhere, where i might be able to get a board the same as this. ive tried ebay and other online stores and cant find them??? i just won a dropdown longboard from australias fav board shop on ebay, just need to know weather its worth the $$$ and how does the board ride with the standard bearings and wheels.. This board was from eskatestuff, not Australia’s Favourite Skateboard Shop. I think that the board from eskatestuff is fine for the money. Browse the skateboard category of this blog for lots more comments, including an easy modification that won’t cost a cent to make the board carve better.